A cascade of pin-ball like effects took place as the Russian-Ukranian crisis developed earlier this year. One result in particular caught my attention. Russian tourism collapsed. After all, who wants to visit a country at war? Air fare and tour prices became attractive. My husband, Yixien, and I knew that the political climate had created a travel opportunity. The historical bond between our countries, Russia and China, inspired travel promotions too good for us to ignore. We bought tickets and packed our bags for our first visit to Moscow. Moscow is Russia’s largest city and its heart. Red Square is her symbol. Construction on Red Square was completed in the late 15th century. The Square is surrounded by Russia’s most precious buildings: The National History Museum, the Kremlin, Saint Basil’s Cathedral, Lenin’s Mausoleum, GUM Department Store. At 90,000 sq. meters (approx.. 970,00 sq. ft.), I was surprised at the small size of this famous landmark since our Tienanmen Square is almost 5 times larger at 440,000 sq. meters (approx. 5M sq. ft). The name Red Square originates from Russian Krasnaya, which means red or beautiful. I have always associated Moscow with the nine colorful, onion-shaped cones of Saint Basil’s Cathedral. 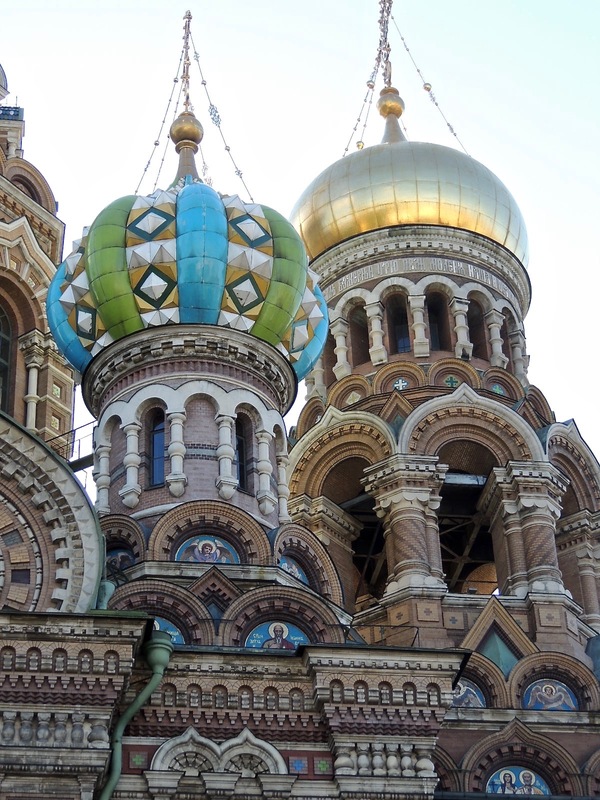 St. Basil’s was completed in 1560 in typical Orthodox Eastern style architecture. Since 1990, it is part of the Kremlin and a UNESCO World Heritage Site. The Kremlin began as a wooden fort, but after hundreds of years of enlargement, it is now a a 275,000 sq. meter (3M sq. ft) masterpiece. The wall surrounding the area is 2235 meters (7,332 ft), 14 meters (46 ft) high and 6 meters (20 ft) thick. There are 18 towers, five of which have red stars made of three-meter ruby. These towers can be seen, day or night, from a far distance. The tallest building is the 81 meter (265 ft), golden roofed Ivan the Great Bell Tower, built from 1505 to 1508. More than 50 bronze bells are stored in the tower, but the largest one in the world is the Tsar Bell, 6 meter (20 ft.) high and 6.6 meters (22 ft.) in diameter and weighs more than 200 tons. The sound could reach 50 kilometers (31 miles), but because the bell is broken, it has never rung. The Tsar Cannon is 5.4 meters long and three people could lie side-by-side in the barrel. Russian craftsmen spent 46 years to finish the cannon, but it was never used. The National History Museum was built in 1873 of red brick walls and silver Gothic style roofs. It has 48 exhibit halls, divided according to time lines. There are 4.5 million articles ranging from ancient to modern treasures. The National History Museum is the oldest museum and once the site of Moscow University. Lenin’s Mausoleum, constructed with red granite and black marble, is only 85 years old. The mausoleum is situated between two review stands. Lenin’s body lies in a crystal coffin. Near the wall of the Kremlin is the Tomb of the Unknown Soldier. This war memorial is dedicated to Soviet WWII soldiers that lost their lives in 1941 battling the German forces. The center photo shows a solder’s helmet on a banner and a laurel branch. Changing of the guard takes place each hour. Returning home without several sets of Matryoshka dolls (nesting dolls) as gifts would be unthinkable. Each doll is carved from a single piece of Basswood so the fit is exact. The dolls are then painted with lacquer. The images vary from traditional Russian costumes to famous Russian presidents. The number of dolls in the nest can be 5,7,10,12…even 15. When a daughter is planning to marry, the mother will give her a 7 doll Matryoshka and wish her to have many children. The cost varies depending on the craftsmanship of the product. For as little as $5.00 to much as hundreds of dollars. Yixien and I enjoyed our visit to Moscow. The trip home was long (36 hours because of delays) and we were tired when we finally arrived in Fuzhou. I recommend visiting Moscow. It is a powerful city; its people possess the stoic attitude typical of northern climates. Sčastlivovo puti (Have a good journey). Zhu Xiaojian taught English at the university in Fuzhou, China. She also briefly lived in the U.S. to learn English and become familiar with the American culture. She is the co-author of Walk Beijing. When I lived and taught English in Fuzhou (1996-97) Zhu and I became close friends. She did her best to teach me Mandarin. We never lost contact with each other. In 2007, I called Zhu and asked her if she would like to co-author a guidebook to Beijing. In August of that year, we joined forces to live in Beijing and write what became Walk Beijing. She is an incredible person and I am honored to be her friend. Her husband, Yixien, was the head of the library in Fuzhou. Her daughter, Chery, currently lives in the North Carolina and is studying to be a nurse. Yixien and Zhu are retired and enjoy travel and photography.